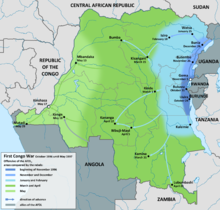 بیرینجی کونقو ساواشی (اینگیلیسجه: First Congo War) کونقو دموکراتیک جومهوریتی و قوْنشو اؤلکه‌سی قوشونو آراسیندا باش وئرن دؤیوش. ↑ ۱٫۰ ۱٫۱ Duke, Lynne (15 April 1997). "Passive Protest Stops Zaire's Capital Cold". The Washington Post. p. A14. Archived from the original on 24 February 2011. Kabila's forces – which are indeed backed by Rwanda, Angola, Uganda and Burundi, diplomats say – are slowly advancing toward the capital from the eastern half of the country, where they have captured all the regions that produce Zaire's diamonds, gold, copper and cobalt. ↑ ۲٫۰ ۲٫۱ ۲٫۲ Thom, William G. (1999). «Congo-Zaire's 1996–97 Civil War in the Context of Evolving Patterns of Military Conflict in Africa in the Era of Independence» XIX (2). اینگیلیسجه ویکی‌پدیاسی‌نین ایشلدنلری طرفیندن یارانمیش«First Congo War»، مقاله‌سیندن گؤتورولوبدور. ( ۲۸ سپتامبر ۲۰۱۸ تاریخینده یوْخلانیلیبدیر). قارداش پروژه‌لرده بیرینجی کونقو ساواشی گؤره داها آرتیق بیلگی‌لر تاپابیلرسینیز.